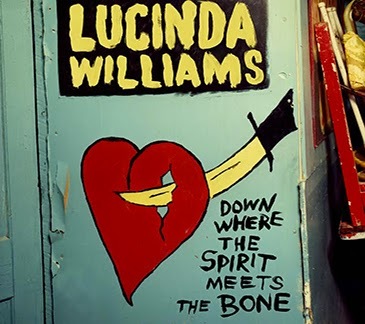 Lucinda Williams is firmly entrenched as one of the mothers of alternative country. She's rapidly approaching the status of legend, if she hasn't already attained it. On September 30th she looks to add to it with Down Where the Spirit Meets the Bone, a massive double album that clocks in at 1 3/4 hours. Much of the musical territory you'd expect to be covered is covered on the album. You've got your standard slow country numbers, like the plodding "Compassion" and the weeping "Wrong Number". You've got your midtempo alternative country in the form of the catchy "This Old Heartache", and "Walk On". And you've got the dark, brooding songs like "Burning Bridges", the demonic "Something Wicked This Way Comes", and "West Memphis", with it's way overdone subject matter. Williams even gives us a nearly 10-minute JJ Cale cover as "Magnolia" rounds out the record. The more interesting moments come when Williams turns up the blues. The rough-around-the-edges "Protection" is a gripping, gritty rocker. "Cold Day In Hell" is a sprawling, clawing slow jam that you can easily get lost in. Williams is the most soulful she's ever been on "Everything But the Truth", a track that catapults towards Gospel. The question remains though, did this really need to be a double album? The answer, unfortunately, is no. There are six or eight tracks on the album ("Foolishness", "Big Mess", "It's Gonna Rain", "One More Day" are all among them) that can be easily eliminated without any debate. There's some strong material on Down Where the Spirit Meets the Bone, however, due to it's sheer size, it's difficult to focus and appreciate the gems through the filler. Lucinda Williams plays Massey Hall in Toronto on November 20th. Best tracks: "Protection", "Everything But the Truth"